It is argued that the "voice of the system" is heard when concepts behind Statistical Process Control demonstrate real deviation from underlying trends. SPC proponents and - of course leading stock market analysts - often use 2 moving averages of different durations to demonstrate this. I think your time series illustrate such step wise change. The question is are we returning to the pre 1950 trend or a new one altogether.? Which will prove to be the real anomaly? I assume the Y-axis is logarithmic but we could do with a label! The clue is in those big bold letters above the chart! It doesn't look logarithmic it looks like £5000 per equal spaced division. The change in the trend rate is no big mystery. 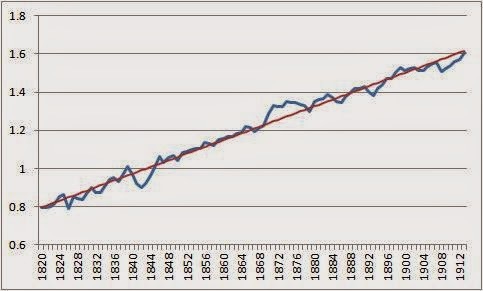 The two trend rates as plotted, intersect in 1932. Older members of mainly macro's "Pseuds Corner", will be aware that this was the time of the partial abandonment of the Gold Standard and the start of a move to using FIAT currency as sovereign nations "unit of account". PS. A "Unit of Account" IS NOT the same as "money" as generally understood by the proletariat. (Acorn). The biggest laugh a proper Mathematician gets is when he sees an Economist, trying to use Mathematics in his models. https://www.aeaweb.org/articles.php?doi=10.1257/jep.29.1.89 . Anyway, it looks like log to the base "n", that is "e" (2.718) to the power of x. So for the x axis max' above that would be e^3.25 = 25.79 assumed to represent £25,790, which is pretty close to the actuality. I do not need to redraw anything. The variable is what it says it is in the heading on the chart (and yes, it is the natural log). SWL there is the "ultimate question" that nobody is asking. Macro-media has no idea what the correct answer is, because it wouldn't understand the question in the first instance. The standard of economics journalism in the UK is pathetic. They all are welded to the neo-liberal myth, that a sovereign fiat currency nation has to "borrow" money from the "markets"; and, that the government can't spend money until it gets some money by taxing the non-government sector. All our political parties are welded to this myth. What exactly will happen if we do not reduce the deficit? Oh I see , and thats why there are no units , ta ! Anonymous@27thFeb09:03, you ask, "What exactly will happen if we do not reduce the deficit?" Is it possible that the 1981-84 and 1992-95 recessions were a totally different type of economic condition than the 2008 event? Perhaps the 1981-84 and 1992-95 recessions were "tight-money-recessions" induced by the central bank deciding to hike interest rates to put a brake on inflation. As such, they could easily be cured by monetary policy with the central bank simply releasing that brake by lowering interst rates once inflation was quashed. By contrast the 2008 event was more like the 1930s depression in the USA. That was only cured after WWII and its aftermath induced full employment and flattened the wealth distribution. 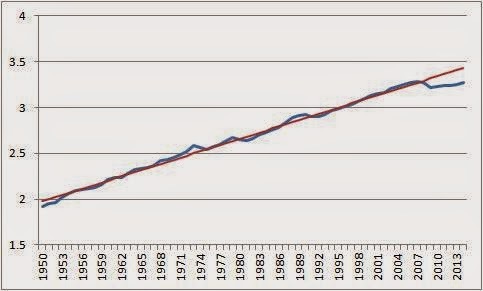 Could it not be argued that, in the last 35 years, there has been huge change in the structure of the economy. In the years of supply side economics, the depressing effect on the economy of rising inequality (and thus higher savings) has been counteracted by the increasing private, corporate and financial debt. The economic stimulus of increasing debt can not go on forever. I would argue that the last 35 years of growth has not been of the quality of previous growth due to reliance on debt. I agree with you about the austerity. I just also think that there is a large debt overhang here which provides a drag on the economy which was not necessarily there in previous recessions. "The big exception, of course, is what has happened since the Great Recession. The deviation from trend just kept on getting bigger,"
The answer is that we have returned to the pre WWI trend of slow growth. The answer why could be found by answering this question: "Quite when and why the growth rate increased so much between the two world wars is a huge question" but as you said "but my concern here is with deviations from these trends" so let's not look for hard answers, let's only wonder about that "new" age we come into. As Piketty is pointing out that inequality was reduced between WWs by destruction of "capital" (mostly money/power of oligarchs) and new distribution patterns that was producing agregat demand creating that fast growth trend. Simple, just look at new trend on distribution of money and you will find answers to that 'huge question'. Strong regulation of banking was ensuring that new distribution of money was constant in sustaining agregate demand and also huge federal spending on R&D. Strong dirigist governments were creating infrastructures that could allow for easy acces and implementation of new ideas and technologies from R&D developed mostly at universities. Since even before Reagan that changed, after Goldwater, TPTB made a plan on how to reverse all that was achieved under FDR which influenced Europe too. To reverse all that which brought new speedy trend growth. ALEC plan. The process was succesfull and wages stoped following productivity growth and banks were deregulated (enforecement was lacking as the first step) which allowed for debt to replace wages as source of Agregate Demand. State is distanced from R&D and put into private hands but with state finacing. Infrastructure for countrywide acces to new inovations is put back into corporate hands, so only specific corporations can benefit from it. Even building physical infrastructure is going back into private control (IT infrastructure) trough privatisation. And post WWII distribution pattern has stoped by banking crisis since new debt can not replace stagnating wages as the source of AD anymore. In simple wording; AD bubble burst and we have returned to pre WWI trend growth. Even the term "Secular Stagnation" which is pointing to this new growth trend is a way to discourage anyone to look at how this period of good growth was achieved and just to relax and take this "new" condition of slow growth. "It could of course be that what we are seeing is part of an adjustment to a new lower trend growth rate that was going on behind the scenes before 2010. That is what the methods used by the OECD and IMF (but not the OBR) assume." I am quite sympathetic to that idea. I think this is something we'll be seeing in the next 20 years (after those 20 years revolutionary new technologies and smaller PPP/capita differences between countries will allow for fast growth again in what are today's developed countries) across the developed countries, with the exception of the US (though they too will not achieve stellar growth). The UK has a huge financial sector, it will fundamentally grow slow, like the rest of the developed countries but at times it can experience strong booms and busts because of that huge financial sector. In my opinion British governments should adjust their fiscal policy to be robust against large fluctuations in the financial sector. This is one I baked earlier (Acorn). Pick from Countries, the US; UK and Euro Area. Pick from the right side menu for each country basic GDP; and Money M1. You will get a graph of each element. Change the origin of the X axis to the earliest year available; so you can see the long term trend. See how the US GDP is nearly back on its trend line, now notice the rate of “anti-austerity” fiscal injection that starts on the Money M1 graph at 2008. Compare that to the UK M1 plot where you will see “austerity” kick-in in 2010 and only start to lift off again in 2013. At which point, the UK is quite a way off its long-term trend line. Compare both to the Eurozone, where M1 appears to have not responded much to the 2008 crash. Hence no fiscal injections to boost demand, just wall to wall “austerity”. The Eurozone is bigger now with nineteen countries. The UK economy is lifting off three years late because of “austerity”. It is only lifting off recently because of the governments budget “deficit”; which is currently about £75 billion bigger than it was planned to be. I wonder whether what was needed in 2008 was to have let vast swathes of the financial system go bust and shut up shop with the employees changing career. The payment system could have been kept going as a nationalized utility until basic low cost private sector alternatives got going. We then wouldn't be carrying the administrative burden of our vast financial apperatus. With all those highly educated talented people doing something other than concocting toxic debt, we might now be thriving. Dumb off-topic question: what caused that big long boom in the 1870's? "Science, Technology and the British Industrial ‘Decline’ 1870-1970"
I would also thoroughly recommend any of his seminars or lectures - I saw one in Japan, brilliant. 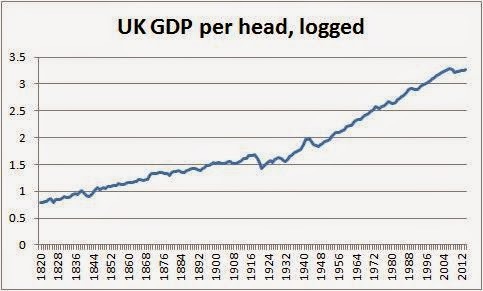 Questions relating to the fundamental causes of rise and (absolute, not only relative) decline of Great Britain are very important which all economists and historians should know something about. It is a bit like a Classicist understanding the causes of Athenian democratisation and the decline of Rome. Perhaps that 1950-2008 period was the playing out of an unsustainable process. It entailed allowing debt and wealth inequality to let rip and at the same time required both debt and wealth inequality to not be too great. Increasing debt and increasing wealth inequality can boost inward capital flows and growth even though increased debt and increased wealth inequality smoother it. The low level of household debt and relatively flat wealth distribution in 1950 set things up for the transition to our present state. Perhaps it is a big mistake to pretend that we can keep doing what we were doing and get the results we were getting? I used similar numbers in my NIER article. Notice that the low UK trend here is due only to the post recession numbers. since your NIER article, or versions of it, doesn't seem to be available, would you like to post your international comparison plot here as well? If Deutsche Bank goes belly up and Germany chooses to save it in the way that the UK government burdened us with saving RBS, then Germany might also come to suffer such a period of economic floundering - I hope Germany has more sense. The "Greek bailout" makes me fear that they (like the UK) will be suckers since the Greek bail out was really just a bail out of the creditor Banks -perhaps a portent of more to come. The financial community exploited modern information and telecommunications (ITC) and realized in the late 1990s that it could in fact make its fees/gains/profits by fueling huge marketplaces where financial-assets are being traded - so they moved away from their historic role as an endogenous lender for real-economy purposes. Especially outside the US, the basics of the demographics also told them to look elsewhere for their gains. The financial crisis caught them up (I just can't stop thinking about how Ponzi, Madoff, needed speed of turnover and exuberance to mask what was going on to almost everyone). Now the financial community, not only has forgotten how to lend traditionally but find themselves in legal/financial positions and huge interconnected marketplaces where their hands are tied, and they are scared that this may all fall apart. The public needs to re-define the financial community - help the sectors within the financial community find what their purpose are now. I'd use the stable models of before as comparative models (Bagehot may return!). The current situation is clearly not working for the bulk of society. The anomaly in the UK is that if the output gap is as large as this analysis suggests, why is the unemployment rate not higher? The IMF 2014 WEO shows an output gap of just 1% for the UK. Together with a current account deficit of 4%, and government deficit of 4% (each of GDP) there will be substantially blood letting to do after the May 2015 elections. Given those deficit numbers, the massive increase of government debt from 47 to 91% during the crisis, people from the continent wouldnt call this "austerity"
The output gap is big with unemployment low because capital is being substituted for with low wage, low grade human labour. It even extends beyond what the unemployment figures imply because people are now retiring later. We go from having high tech machines doing the work to having to do it by hand. The high paid jobs inventing and making the machines get replaced by a larger number of crap jobs. It ruins the economy because future profits come from reinvested current profits. Now there is no investment because cheap labour can substitute for machines so instead profits go to share buybacks and future profits have to come from government deficits and debt expansion. would you mind to provide any evidence for your numerous claims? From a historical point of view you were correct to avoid the period 1914-1950, these were periods of exceptional tumult that will distort any long term trend. As Piketty, Maddison and others have pointed out these left long legacies into the post-WWII period and if included give misleading views about the dynamics of capitalism. Many would also argue that the period 1950-1970 (the so-called "Golden Age") was also exceptional in its 'benigness' as it set off by one off technological innovation from military related one off extraordinary technological innovation and recovery from destruction. But we do not want a war to deal with 'secular stagnation'! Have you read Schumpeter and his theories about 'creative destruction'? I come from a US perspective. We had a lot of painful deleveraging that gutted demand, increasing an output gap. Mild fiscal stmilus at the federal lvl but hard austerity at state and local lvl. I think the near death of unions sparked inequality and the growth of the financial sector are troubling signs. Income inequality in a democracy where corporations are legally persons creates a power feedback loop, where the wealthy buy more power to secure more money for heirs. This money rots trusts and you get secular stagnation. all that is probabl true, but it doesn't explain why growth started to fall back in 2007. The tendencies you describe have been going on over a longer period and the results should thus manifest themselves over a similar period.